One of the best gifts a writer gives to others is the reminder that no one is alone....That no matter what you're going through, someone else has been through it....and lived to write about it! Dr. Amy Botwinick is a perfect example. Having gone through a traumatic divorce several years ago, she decided to share what she had learned with others. Both of her books about surviving a divorce and thriving after are helpful and informative, but with a twist. She lightens things up with a sometimes humorous perspective on a serious subject. Congratulations On Your Divorce...The Road to Finding your Happily Ever After...(2005) Optimistic, chatty and accessible, guides you through the treacherous paths of divorce and into a life of renewed joy. 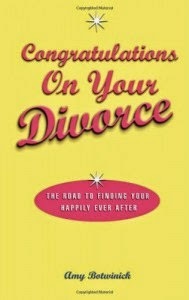 It describes the world of divorce—warts and all—with some much-needed comic relief and heart. You’ll realize you’re not alone as you read about how the author and other women have coped with the emotional craziness of un-coupling, jettisoned their emotional baggage and gotten back on the road to defining and finding their happily ever after. Excerpt from Amazon.com. After the success of her two books Amy was inspired to create a musical and Divorce Party the Musical, A Hilarious Journey to Hell and Back, was born! She collaborated with Mark Schwartz, a successful Author/Producer (Nine, La Cage Aux Folles, Menopause the Musical, etc. ), and Jay Falzone, Book/Lyrics/Director/Choreographer, (Cooking with the Calamari Sisters, Calamari Sisters Big Fat Italian Wedding, SHOUT! The Mod Musical), etc. Divorce Party the Musical first debuted in Florida in 2012, with limited runs in several cities after. Divorce Party Las Vegas opened for a long term run in Las Vegas last month at Ballys' Windows Showroom! Cast and creators on opening night are pictured below. "We are the stuff that dreams are made on and our little life is rounded with a sleep." The Tempest brought to life in this way has been a fantasy of Teller's for thirty years. What a lovely gift this magician has given to our magical city....to bring his dream to life for the first time and to do so inside a tent at The Smith Center's Symphony Park in downtown Las Vegas. Leave it to Teller to stage the show in this way, with magic, illusions and music so that it may be experienced as it never has before. The mission of The Smith Center, is "to build and establish a high quality performing arts center ....by supporting artistic excellence, education and inspiration for all." So this is a dream realized by The Smith Center in that this type of production not only takes place, but originates here. The Smith Center has done so much for Las Vegas, by creating options that never existed before and helping to spread awareness that Las Vegas, a town of musicians, actors, dancers, artists, visionaries and more is a city brimming with culture. The production will move on to Cambridge next month to Harvard's Loeb Drama Center, then perhaps eventually Broadway. The other major player making Teller's dream a reality is his Co-Director Aaron Posner, with whom he staged a production of Macbeth in 2008. The other night when I entered the tent what struck me first was the smell and feel of dried grass under my feet. 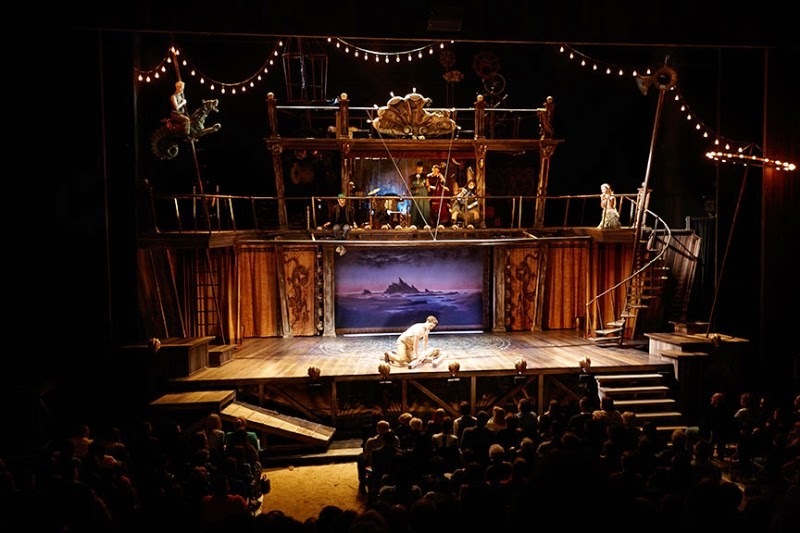 As I rounded the corner from behind the bleachers and saw the stage, I had a flash of what it must have felt like to see a play at the Old Globe Theatre back in Shakespeare's day. Then, upon hearing the song..."Everything You Can Think of is True," I felt infused with the coming magic already. Our story starts with a tempest...a violent and windy storm. Prospero, the main character, creates this tempest to trap his deceitful enemies, one of whom is his own brother, Alonso. Prospero, having been sent adrift 12 years before in an unworthy sea vessel with his 3 year old daughter, so that Alonso could steal his title as Duke of Milan, now seizes his chance for vengeance. As expected his brother and his posse have not changed a bit. Prospero, a magician, has a few tricks up his sleeve. The enemies are in Prospero's territory now and instead of violence he enacts his revenge with disturbing and bizarre illusions. After this, the island and its inhabitants are truly in a whirlwind surrounded by trickery and vengeance, never sure what is real and what is not, and so are you, fair audience. The equally important focus of the story is on Prospero's love for his daughter Miranda. She has no memory of life with anyone other than her father and a few unusual island inhabitants, until the strangers arrive. The cast is made up of members of the Harvard affiliated Actors Repertory Theatre, (A.R.T.) and the dance company Pilobolus. 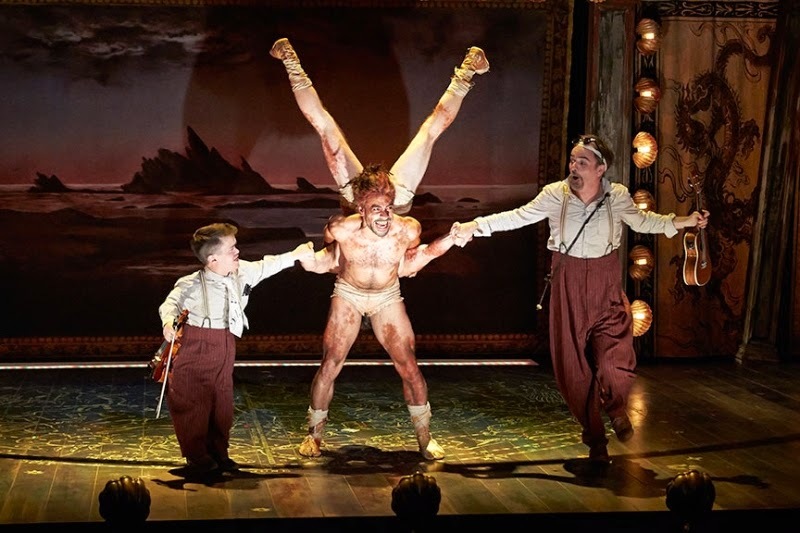 Incorporating Teller's magic into this production was a unique part of the actors' roles, and they did it beautifully. Although I have studied and performed Shakespeare I have not seen The Tempest before, so this was truly special for me. The music and lyrics of Tom Waits and Kathleen Brennan combined with the bluesy and other worldly sound of the spirit band Rough Magic, lends a dreamy and introspective background to the experience. Songs such as "You're Innocent When you Dream," and "Shiny Things," and the lead singers, Miche Braden and Shaina Taub, are wonderful. Their voices together are seductive, haunting and oddly comforting. Tom Waits' music completely transports the audience to the strange world that the cast and crew of The Tempest have so skillfully created. What the integrated magic does is match the audience's experience to the characters in the sense that we are never sure when we are going to see something odd or amazing, including characters emerging from house left and right. 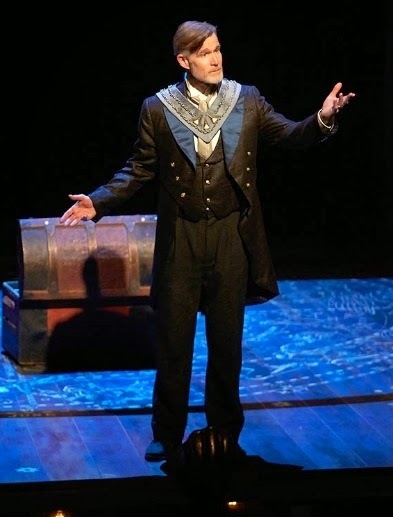 I found it interesting that the two Shakespeare plays Teller has chosen to bring to the stage are also the two that deal most with the use and abuse of the powers of magic and the spirits. Teller's lifetime of experience with magic gives him a perspective of these works that few have. Shakespeare wrote The Tempest after having written about humanity, greed, power, love and so much more, for decades. Most experts say it was the last play he ever wrote entirely by himself. I like to think perhaps with The Tempest he was writing about the most enduring human emotion of all, love, and that is what to look for in the midst of the "tempest" that is all of our lives. "We are the stuff that dreams are made on and our little life is rounded by a sleep." William Shakespeare was born on April 23 and died on his birthday, 52 years later. 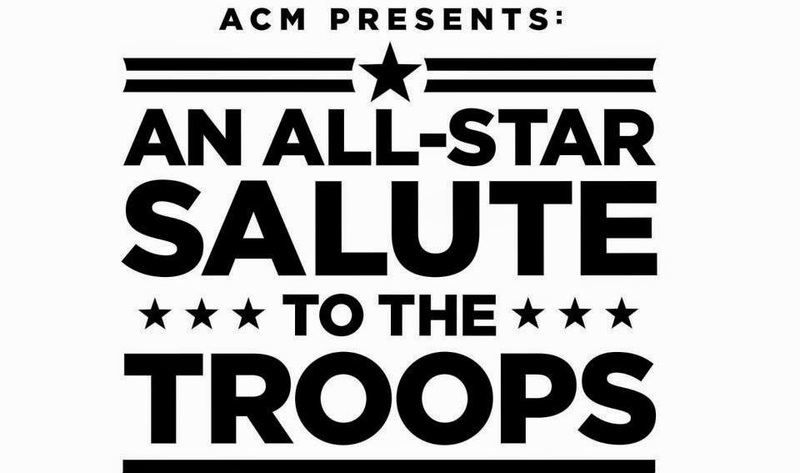 The Academy of Country Music did just that with the "ACM Presents: An All Star Salute To The Troops." The show was taped Monday night with a live audience at the MGM Grand Garden Arena with hosts LL Cool J and Chris O'Donnell, and will air on CBS on May 20th. It was great to be a part of the production as a rehearsal actress. Though it is always a pleasure to work on these concert events, it was especially true for this one. One of the best surprises of this show is that almost all of the country music superstars are performing with a talented member of the military! Whether it was Lee Brice accompanied by Army Sgt. Christiana Ball on I Drive Your Truck, Rascal Flatts & Marine Corps. SSGT Brandon Valentine on Rewind, Keith Urban and Navy STGC Destiny Coates performing, For You, or any of the other powerful and poignant performances, adding this element to the tribute was meaningful and exciting! Of all the genre of musical performers I work with it has always been the country music artists who seem the most grounded. For one thing, they never just "phone it in." This was evident more than usual in this case. The passion, honor and respect shown by the likes of Tim McGraw, Toby Keith, Luke Bryan, The Band Perry, Dierks Bentley, Hunter Hayes, and others moved the crowd, (including myself) to tears many times during the taping that night. Carrie Underwood made the event extra special and personal by co-writing and performing a special song just for the occasion called Keep Us Safe...which can be downloaded soon. (#KeepUsSafe). More important than our emotional indulgences, (anyone can cry), it reminded many us of the commitment and sacrifice made every day by these fine people. If this invokes action on the part of viewers of this special tribute in the way of volunteerism, donations to various veterans programs, and compassion for our active and retired military, among other things, then the show has truly done its job! To cap off an amazing night Toby Keith was surprised with a "Spirit of the USO" award. 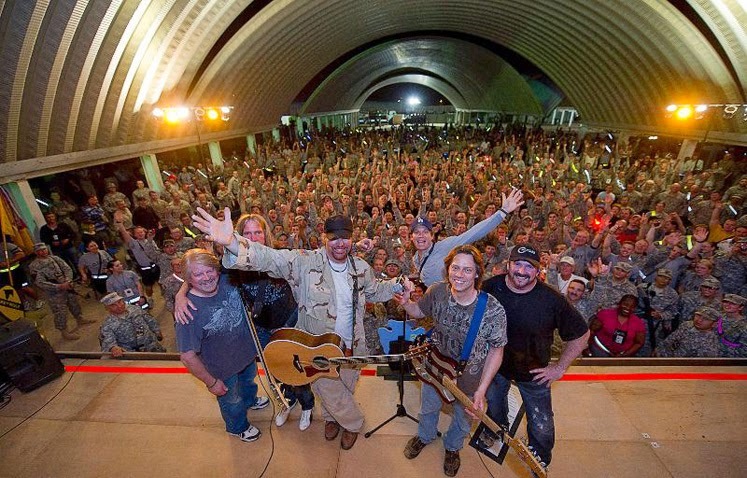 Not many people know this, (I didn't), but since 2002 Toby Keith has toured on behalf of the USO performing over 300 shows on 11 USO tours in 15 countries! Even in extremely remote regions, he has managed to show up. Set your DVR's for May 20, (CBS) and be motivated by the strength, courage and perseverance of the individuals that make up our country's Army, Navy, Air Force, Marines, Coast Guard and Reserves! Interested in volunteering for our veterans? This blog article is dedicated to two of my family members...Justin Hattesohl, Decorated Afghanistan Veteran and Purple Heart Recipient, National Guard 849th, (2014), and Sara Wendt, Iraq Veteran (2007-2008) Staff Sgt. 934th Aeromedical Evacuation Squadron. Also, a special salute to other family veterans, Navy; Ernest Duane Wendt, Gary Wendt, Ralph Nelles and Bill Nelles. Army; Barry Wendt, Robert Lumpkins and Air Force; Cory Schneider. Thanks to all of you for being a positive representative of our family and a role model to the next generation by way of your military service. ACM Awards final curtain call at MGM Grand Garden Arena? It was nine years ago that I worked my first Academy of Country Music Awards. I was standing in for Carrie Underwood (among others), and back then she was only known as the winner of American Idol. But with her first single Jesus Take the Wheel rising up the charts, it wouldn't be long before that changed for good. Listening to her perform that song at rehearsals it was obvious that she was born to be a star. Nine years later it's hard to imagine she ever wasn't! I've had the privilege to witness many artists like her go from excited newbies to seasoned pros and everything in between.....It's a great inside perspective and a fun part of the job. Back then Darius Rucker was still "Hootie" to most people and now he is now more known as a country music artist than anything else. Taylor Swift was 12 years old and dreaming while she wrote her little songs hoping to get a record deal someday. Nobody had ever really heard of Jason Aldean. There was no "Miranda and Blake." Brooks and Dunn were still together. Facebook had just launched the year before and social media was not part of national television advertising or promotions. Since then and during the nine years working this show, besides standing in for Carrie every year I have accepted and presented awards for "Best New Artist", "Song of the Year", "Best Female Artist", "Entertainer of the Year", and more. I have danced onstage with Brooks & Dunn, Toby Keith, Trace Adkins and Blake Shelton, to name a few. I have performed as Carrie Underwood with my sister Karen next to me as Miranda Lambert and done Reba McEntire's job (as her rehearsal host), before she arrived. Now at this year's ACM Awards I am feeling a little nostalgic because I found out the show next year, which will be the 50th Anniversary, is going to be be held and broadcast live from Dallas. So I won't be working on it. I'm sure they'll all enjoy the change of pace, but they will be back here very soon. According to reliable sources quoted in the Las Vegas Review Journal this past Thursday, the ACM Awards will be back in Las Vegas for its 51st...Better yet, it is expected to be one of the very first events held in the brand new mega arena that is going to be built by MGM Resorts International and AEG. This 20,000 seat arena will be placed near the Monte Carlo and New York New York properties and is set to break ground later this month, and be completed in the spring of 2016. The only thing constant is change and with that in mind I will enjoy what will likely be the last Academy of Country Music Awards in the MGM Grand Garden Arena. Hats off to you, you've been a great host!